Missed opportunities for truly integrated, intelligent maintenance systems occur when a building maintenance system is only thought of after design and building development. If the system is included as an integral consideration of the building at design phase and the architectural plans it then presents an opportunity to develop a maintenance system that is tailor-made to meet the usage requirements, perform in harmony with structure itself and complement the building’s design aesthetic, all while being more practical and easier to operate than standard maintenance products which are simply ‘tagged on’ after construction is well underway. Manntech holds a long history of working with architects and developers to provide building maintenance systems for the world’s most complex structures. Often, working in close collaboration with architects to provide bespoke access solutions to meet their specific needs has led to Manntech pioneering many of the systems seen in the industry today. Manntech engineers can, for instance, work closely with architects early in the process to feature the maintenance units as part of the structure itself. Another option for concealing the units includes the provision to drive them into garages where they can be stored behind closed doors. Garages such as these are commonly located on the roof but, where that is not possible or not desirable, garages can also be sited in the side of the building. The unit might need to be located some distance from the façade due to the design of the building, the track placement options available or the structural support required. With a telescoping jib of up to 50 metres, the unit can achieve a discreet small footprint in parked position while also providing the necessary outreach to access the facade. In some occurrences, buildings present dual challenges of a curved facade surface with severely limited roof space available, if any. In this example, the BMU can be designed to leave the building and traverse horizontally across the curvature, before returning for internal parking. In a world first, Manntech developed and installed a 3D climbing BMU which can, at the same point on the track, change both climbing angle and direction or travel. We have also developed systems which use built-in self-levelling mechanisms which allow our machines to navigate uneven surfaces with complex geography. Increasing the mobility of the rig in this way also means reducing the number of units which would otherwise be needed. It is possible for Manntech access machines navigate their own way out of tight or awkward conditions automatically. Specific launch sequences can be programmed by our designers, making use of smart-logic controllers. This cuts down on the risk of collision and can also reduce cycle times. Manntech has been called upon to provide innovative bespoke solutions designed to overcome the challenges presented by buildings which feature shelves, deep building recesses and huge overhangs. A range of possible solutions include upside-mounted units suspended from tracks in the soffits or an articulated jib capable of launching from the roof and traveling underneath an area which is otherwise problematic to reach. Manntech can also provide cradles which are designed to move in three dimensions, changing position vertically and horizontally as well as moving forward towards the building to access recesses. Manntech’s expert team have, quite literally, been entrusted with some of the biggest challenges in the world. Manntech building maintenance systems can be found in use at number of the most ground-breaking buildings across the globe, including super- and mega-tall skyscrapers. With over 60 years’ experience in the industry, our team have the know-how to deliver a reliable solution for any project, including for the world’s most complex architectural structures. Manntech’s experience and expertise as the innovators of bespoke building access systems can be seen in numerous unique solutions tailored to the specific access needs of a wide variety of uniquely challenging projects. As industry leaders, Manntech have built a reputation as specialists in developing custom facade access solutions to meet the maintenance needs and preserve the appearance of the most unique and iconic buildings in the world. 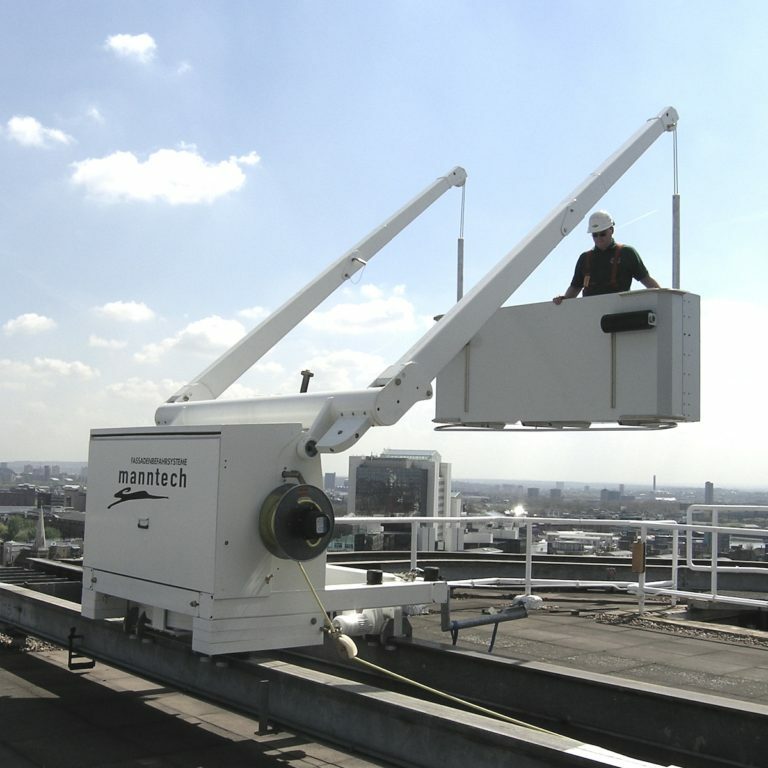 With the longest history of any building access provider, stretching back over 60 years, the Manntech brand is well established as the pioneering innovator of bespoke building maintenance systems. Across numerous projects all over the world, our design team have proved themselves capable of developing facade access systems which overcome any challenge they are faced with. In spite of the time pressures involved in redesigning an earlier proposal at a relatively late stage, Manntech were able to step in and ensure the client could enjoy peace of mind with a tailor-made and reliable facade access solution in place.